A senior editor told a group of DMU students he was quite happy to have lost 30,000 off his print circulation in the past two years. Simon McGrath, Editor-in-Chief of Camping & Caravanning, explained that his relaxed attitude was because over the same period he had added 40,000 subscribers to his digital edition – taking his total distribution to over 260,000. “I don’t believe print is dead – far from it,” Simon said during a guest lecture to David Penman’s Magazine Publishing module. Simon explained how his team had taken the world’s oldest camping and caravanning magazine into the digital age, offering readers the opportunity to go ‘paper free’ by developing a digital publishing strategy for the 21st century. The students, who are preparing for a major project which will see them work in small groups to develop a business plan for a magazine launch, were told there were other benefits to the business, other than simply growing the audience. Simon said that the major costs of producing the magazine were the ‘Three Ps’ – Paper, Print and Postage – and that by some subscribers switching to digital meant costs were reduced. His digital strategy had also driven up interactivity, with more and more readers clicking through from their digital edition, and more readers booking their holidays too. 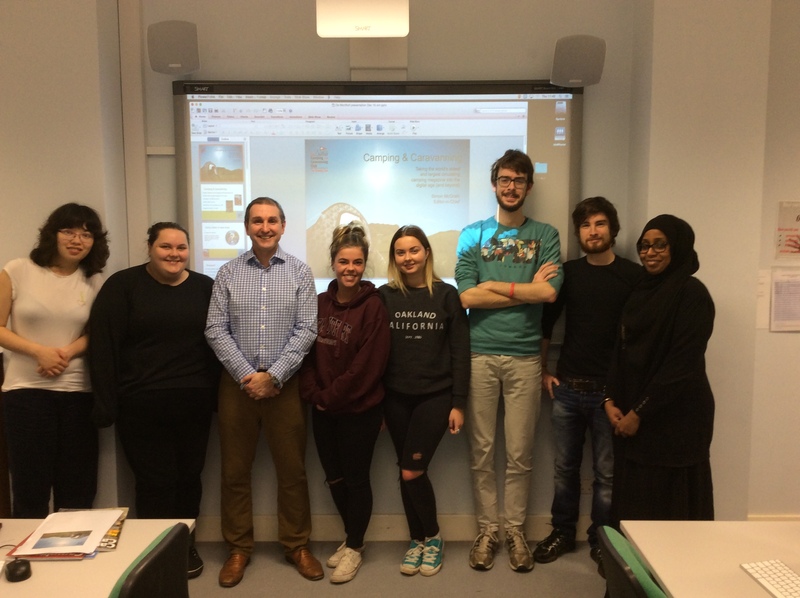 Simon is one of three industry experts David has invited to come to DMU to share their experience with his students as they investigate the magazine industry – from high-profile high street glossies to niche business-to-business publications. During the course of the first term students have studied editorial, advertising, print and production techniques, business finance, customer publishing, and digital strategy. Before the Christmas break they will look at marketing and distribution and how to launch an independent magazine.